Maruti Suzuki is every bit Japanese. Its a common misconception for people to think otherwise. Way too early but Harrier has to have a huge 2nd month for all the hype. Forget the AT, even a sun roof would have contributed 10-20% more numbers in the sales figure. Refreshing to see XUV-5OO bounce back. Although, I believe it could be temporary. If Harrier doesn’t catch the fancy of the buyers then XUV-5OO will rejoice. This is particularly considering the fact that the next gen isn’t way too far away in the future. This is the thread that I wait for every month. I will leave it to the others to do a deep dive and discuss. I will stick to the class of cars that I am primarily interested in - the MPVs. On the outset, I am so happy to see that the Marazzo is holding it's own. Frankly, I expected its sales numbers to drop significantly after the Ertiga debuted. Well, I guess people are starting to value better engineering and higher safety standards. That's heartening and should be a shot in the arm for Mahindra and Tata. For what it's worth, I seriously thought that the new Ertiga was going to wipe the floor with the competition. Certainly, the car looked great in the media pictures; and my showroom visit revealed that Maruti had paid attention to customer feedback and applied big fixes to the interior to make it more usable. I was happy. But, then something changed. After waiting a full 6 weeks, I finally TDed the Ertiga. From the drivers seat, the car felt and drove exactly like my Ritz. Not even a shade of difference. There was the same amount of elbow room for me with respect to my passenger. The rear bench felt roomier in terms of legroom and shoulder room, but only slightly so. The third row was definitely good. Good space for 2 people with recline function and good leg room (especially if the 2nd row is fixed to suit the leg room of my family). The boot took the exact same 3.5 pieces of luggage that my current car accommodates. All in all, I felt that I would just be getting an extra row of seats if I chose to go with the Ertiga. Then, there's the road noise aspect. Many a times, I have gunned the tiny 1.2 l in my Ritz and the cabin has stayed incredibly silent. In the new Ertiga, that 1.5 l petrol is L - O - U - D. Creates a freaking racket!! Car didn't feel quiet at all. By comparison, the Marazzo felt so quiet and refined. A couple of days later, I was on out for a weekend ride and saw the new Ertiga fully loaded on the highway. As I approached from behind and passed the car, the exterior styling that had looked good to me earlier started to feel overdone. The car just didn't feel like a contender. So, bottom line - not a great upgrade from a driving point of view. Noisy interior. Same boot space. Wasn't feeling the exterior styling any longer. At that exact moment, Mahindra stuck us with the 4 star GNCAP rating for the Marazzo and I shelved the Ertiga for good. Game on in the MPV space. Have you ever noticed the SUZUKI icon which the Maruti cars get adorn with? There is a reason for the same, and that is the same reason for considering Maruti as Japanese. It is not an Indian anymore, even though people still think otherwise. b) Too early to say this, quite a few of these 1370 cars would be display/TD cars. c) This has more to do with dealer funding. Dealers operate on limited funds and would buy the new harrier from the OEM than the older Hexa, which they would be having in their stocks. Next 2 months will clear the picture. Dear Mods, the chart for OEM wise Total sales is missing. Please add that as well. Probably because all the key technology and design inputs are still coming from Suzuki Japan. This is the reason Maruti Suzuki pays fat sums as royalty to Suzuki Japan. Last edited by AutoNoob : 7th February 2019 at 15:26. Mid-Feb launch, so display / TD cars might show up in Feb dispatches at best. Why is Maruti categorised as Japanese? Personal opinion that pre-dates my forum membership - Indians view it with a Japanese connection and not as an Indian brand like TATA and Mahindra. Also - technically, it's a 56% owned subsidiary of Suzuki Motor Corporation. Santro still underperformig IMO, although selling better than Eon. Personal experience - Their showrooms are trying to sell the Grand i10 over Santro - the discounts on the Grand i10 and it's superior 1.2L engine doesn't help this cause either. While I understand that the facelift is coming in, I can't believe that it would be 0 sales, especially with a jump in sales in Dec. Is the data accurate on the Endeavour? Also, I was expecting higher numbers for the Harrier. May be its just too early and I should wait for another 2 months for it to move up. IMO, though automatic is missing, it has what it takes to hit 4 digit sales. a) Why don't we have Mitsubishi Outlander on the chart? b) Both Endeavour and Figo have zero dispatches, does it mean that all the kits were exhausted in December itself. Harrier numbers seem to just be dealer demo and display units, not for sale to end consumers. So they reflect nothing. Hexa seems to have dropped numbers on it's own unrelated to Harrier. Kicks on the other hand include end customer units, but may be just shipments to dealer for the present. A lot of customers defer Dec purchases in favour of Jan new year, so that itself accounts for an increase in Jan shipment numbers for all vendors. 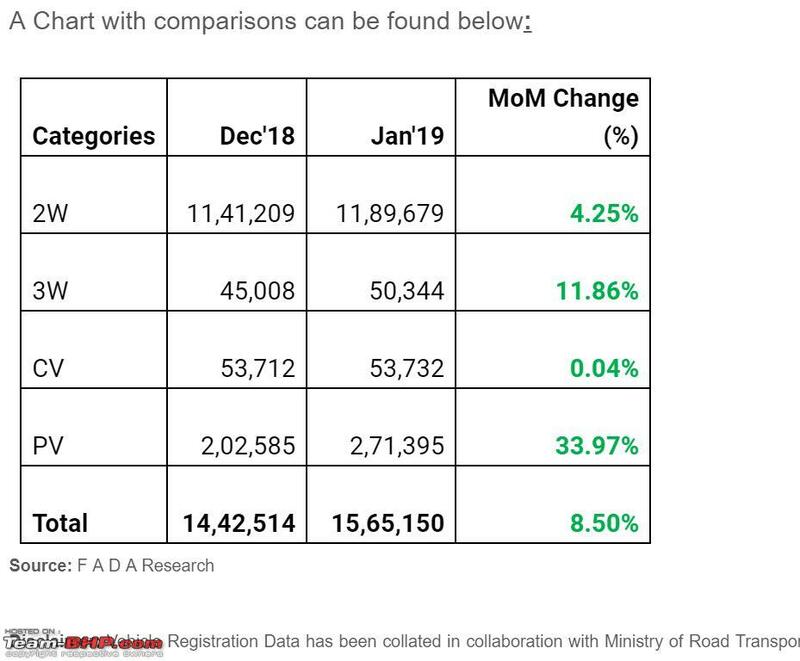 A lot of Mahindra increase over TATA from previous month was thanks to Bolero numbers increase, but overall XUV and Marazzo is contributing well. People still buy the Xylo? Endeavour dispatches is a clear indication of updated version launch to happen soon! I heard from dealer who is having 2018 inventory and was offering 2-3 lakhs of discount. While Tata has claimed big number of bookings for Harrier, the dispatches does look like a mismatch. Given that the product looks competent, I expect numbers to gradually increase like that of Nexon! As someone mentioned sizeable chunk of Hexa users seem to have shifted. There was also an ad which mentioned 1.2lac worth benefits on Hexa. Most awaited thread of the month. 50% share held by Maruti is a feat for itself. Seems like Ignis and Grand i10 gave its share to the new 1.2 L Wagon R.
Will it be possible to get the break up between the 1 L & 1.2 L Wagon R to see how the market has responded to this? Honda seemed to have some growth, but will they continue this growth without any serious releases at least to the end of 2019. Fiat is slowly dying its death. Need to see how XUV 3OO is going to shake the pseudo SUV market. Going by the reviews it’s not only the Brezza, Nexon, Ecosport, WRV but I see Creta also getting impacted. A mighty competitor from the Mahindra's stable into this segment. Prospective Creta buyers might not look at Harrier as yet. Not definitely in January. Many Hyundai or Maruti buyers don't consider Tata products. That's a fact and Tata has mighty struggle ahead of them to overcome this perception. I had a first hand experience of this thinking. A friend wanted to buy a second car ( he has an Innova). He considered Baleno, S Cross and i20 and finally bought the i20. During the course I suggested he try Nexon. He reluctantly went to show room, threw a cursory glance at the car, asked for discounts and when told there were none, he dropped Nexon. After a week he met me to show the i20. I was in my 2014 Zest. He had never seen my car till then. He sat in the car, examined a bit and asked why didn't I suggest it. I said it's a Tata. He kept quiet and went away. I have been in the market for a mid sized SUV now for a month. I lost interest in the Harrier due lack of auto, sun roof, 4X4 etc. One of the models on my list was Hyundai Tucson. I took two test drives during Jan 19 and the family was more or less sold on the vehicle. The top model with the beautiful new panoramic sun roof, 4WD, Auto had everything I needed... BUT there was no worthwhile discount on offer. And now I see the sales numbers for Jan 19 and it makes me wonder... Has Hyundai given up on Tucson or they find themselves in a catch 22 and don't wish to disturb the Creta party by lowering Tucson price. What could be the reason for allowing themselves to be pushed out of an entire segment ?? Mod Note : Please avoid typing with excessive dots.........like................this. Last edited by moralfibre : 8th February 2019 at 10:23.